Kareem Abdul-Jabbar joined the Los Angeles Lakers before the 1975-76 season burdened by the expectation of superstardom. Kareem immediately rejuvenated a floundering Lakers team, leading them to a 10-win improvement over the previous season in Bill Sharman’s final year as head coach. Kareem dominated on offense and defense for the Lakers, scoring 27.7 points per game while leading the NBA in blocked shots (4.1) and rebounds (16.9), with both numbers ranking as his career-best marks. Abdul-Jabbar led the NBA in minutes played, at 3,379, and won the NBA MVP award in a close race against Bob McAdoo and Dave Cowens, accumulating 52 first place votes to Cowens’ 48 and McAdoo’s 47. 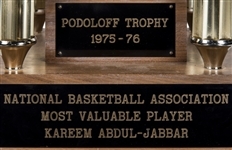 Offered here is the Maurice Podoloff NBA MVP trophy presented to Kareem Abdul-Jabbar at the end of the 1975-76 NBA season. This historically significant trophy measures just over 42 inches tall and stands on a base that measures 13 x 13 inches. 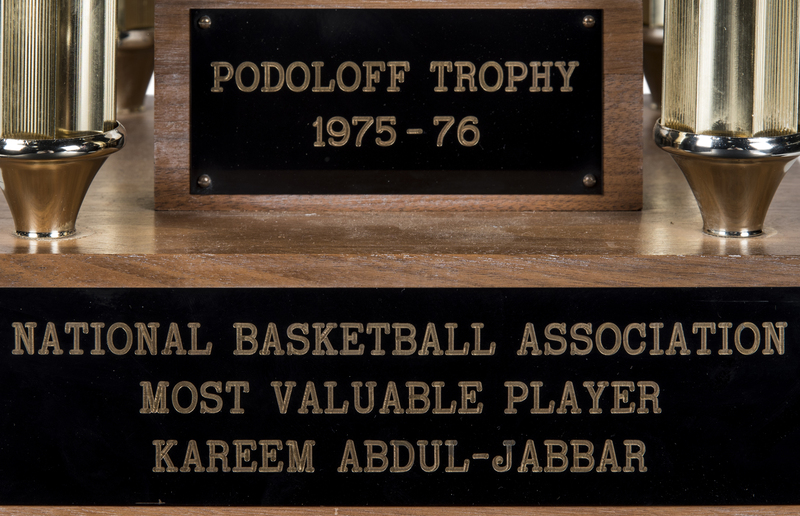 The base is tiered, with a plaque affixed to the top tier reading “Podoloff Trophy / 1975-76” and a plaque on the bottom tier reading “National Basketball Association / Most Valuable Player / Kareem Abdul-Jabbar". A trophy cup topped by a statuette of a basketball player stands on the upper tier. Four columns support a wooden plinth, with basketball player statuettes located on each corner of the plinth. A large trophy cup topped by a fifth statuette is located on the center of the plinth. 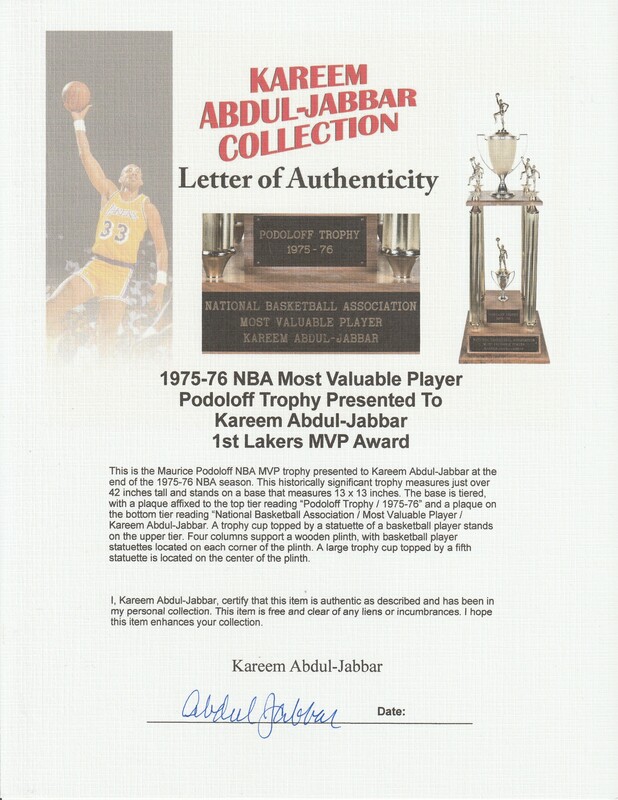 This trophy is an incredible piece of NBA history, and it is accompanied by a LOA signed by Kareem Abdul-Jabbar.